Dear friends and followers alike! 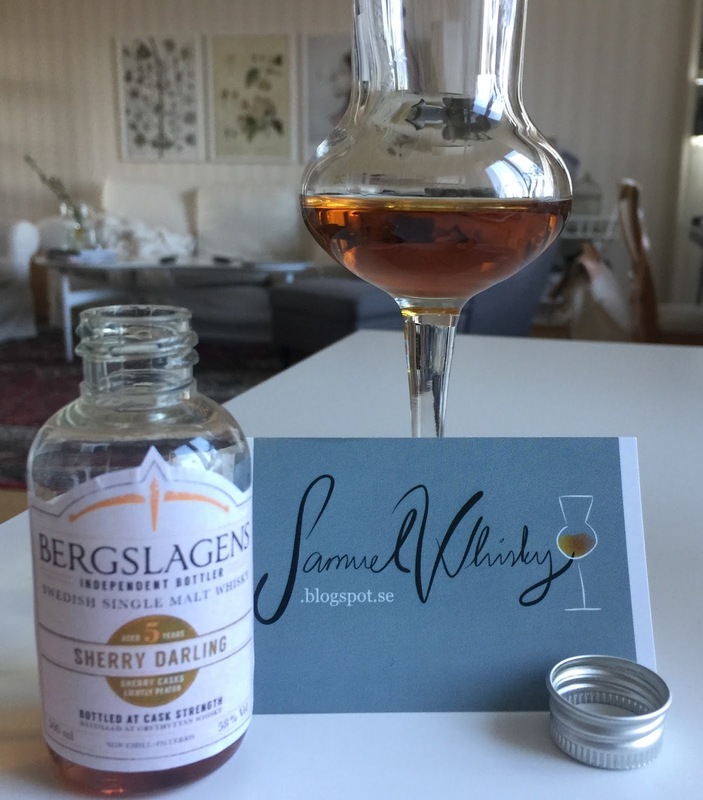 Once again I was fortunate enough to receive a package from the people at Bergslagens Distillery. This time the label states: "Sherry Darling Aged 5 years sherry casks lightly peated". This is the second release in a series of three (please feel free to read my thoughts on the first release in the series here). 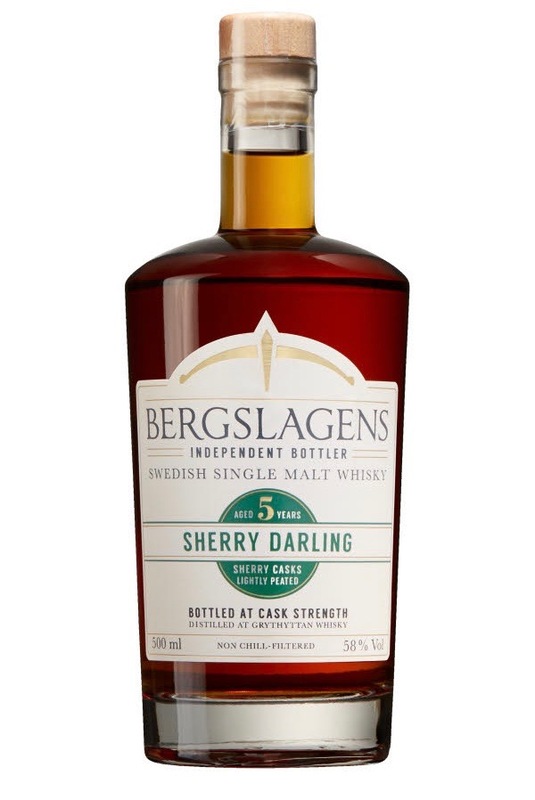 Just as I wrote in the post of the first release in this series, and as you all know by now, this whisky has not been produced or distilled by Bergslagen Distillery but it was distilled at the (now closed) Grythyttan Distillery. This is in other words an independent bottling by Bergslagens Distillery. The pressrelease states: "The Whisky has been matured in a number of 50 litre [sherry]casks for five years". Well people, that was kind of secretive wasn't it?! Once again, sadly, there is no mention either of type of sherry (but I'm guessing Oloroso) or of what kind of oak (european or american). Also no mention of exact number of casks. The pressrelease does state that the 58% ABV is cask strength (but I wonder, is it rather not vatting strength we are dealing with here, and watered to that exakt ABV?). 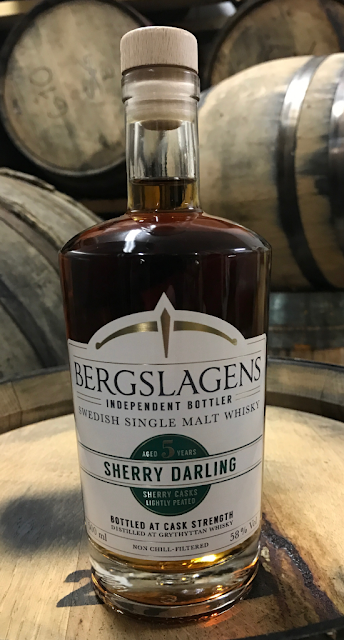 Maybe, sometime in the near future, Bergslagens Distillery can share some more precise info on these details as Smögen Distillery and Box Distillery usually do. However, to my immense joy, and to your satisfaction, I happen to know that "lightly peated" in the context of whisky produced at Grythyttan Distillery in fact means 15 ppm. With that said, this release will be available tomorrow (tuesday the 2nd of May) in three of the state monopoly stores located in the swedish town of Örebro. It will also be available to order via the order-assortment. In total, 840 bottles will be available. Ok, let's see what we have this time around! Not at all an extreme sherrybomb this time (compared to the unpeated sherry darling that I have as a reference, as you can see from the pic below). Although there is a lot of sherry influence going on here it is somehow subdued. Instead of the extreme raisins that we had in the unpeated sherry darling, we have in this lightly peated version something mould-y going on, the mould on brie cheese. We also have medium ashy-y vanilla, the peel of sunwarm red gooseberries and a slight touch, just a tad, of very earthy peat. Yes, earth (soil), and sugar coated dried figs. Also, this ligtly peated version is calmer on the alcohol; I can without any problem at all take a deep, deep breath with my nose without feeling any alcohol at all! Now that’s just wonderful! There is also a sweetness in this one that is very, very mouthwatering, maybe something like freshly squeezed orange juice with lots and lots of white sugar in it (the emphasis is definitely on sugar), well, that’s it, now I just have to have a taste! At first everything is so sweet (syrup) and i-n-c-r-e-d-i-b-l-y smooth, so smooth! When swallowing, everything gets medium dry very fast. Than an explosion of flavours occurs; it literally screams of vanilla leather, medium dry milkchocolate, cold-brewed coffee, sugardrenched dried figs springled with freshly squeezed sugared lime juice and finally some wonderful peat! Very big on the flavours, meaning that a lot is going on, but not at all overwhelming. Rather more-ish (”I want more!”), and the best thing is the peat, it is in perfect balance with all the sherry-stuff going on here, wow! For me, this is a lot better than the unpeated version. This one is a sherry bomb but not an extreme one. The peating-level sure is perfect for this amount of sherry influence. Ok people, hold on, because taste-wise this is by far the best sherry matured swedish whisky I have tasted so far! And, I realised it the second at which I swallowed and felt the explosion of flavours, mmm… Big congrats to the people at Bergslagens Distillery for closing this deal and big thanks for the opportunity to taste it before being released! Sláinte!